India is a country with substantial natural resources with wonderful landscapes and variety of seasons to suit different wildlife making the Indian safari a memorable experience for the tourist. This great nation has in its store more than 500 wildlife sanctuaries, which includes the sanctuaries under ‘Project Tiger’ started by the Government of India. Wildlife enthusiasts, across the world, are genuinely interested to have the first hand experience of the safari in India for the adventurous wildlife tour. Various opportunities are available in the safari tours India, which a wildlife loving tourist finds satisfying. 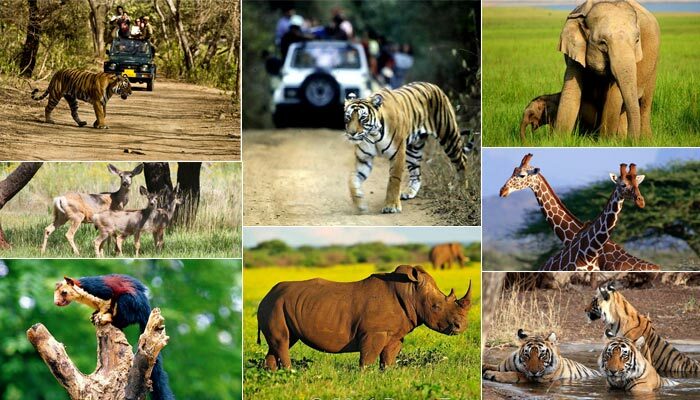 Here is a short glimpse of the famous Indian safaris, which rank very high in this part of the world. Kaziranga National Park’s Elephant safari is a prime center among-st all the safari of India, owing to its natural backdrop of mountainous terrain with valleys around as the abode of more than hundreds of rhinos and many other rare animals of the wild. The particular Indian safari has already earned its status of the world heritage site by authorities for the largest composition of tiger population among the best in the world. Tourists from every part of the globe throng here to experience the rare inhabitants such as wild elephants, buffalos and the illustrious swamp deer. In bird sanctuaries, the Bharatpur bird sanctuary has the unique collection of more than 230 kinds of birds. It is a must see place for safari in India, where a great number of Siberian cranes flock around this place from the west during the winter. It is another heritage site that boasts of the colorful quality of birds in ducks, wagtails, eagles, flycatchers to make the Indian safari a great experience. Over and above, the place is a home for Nilgai, Sambar, Boar and Chital to name a few. As a wildlife tourist, you must visit the Jim Corbet National park, named after the great hunter and wildlife lover Jim Corbet. It is situated in the sub Himalayan terrain with mind boggling range of greenery with nearly 500 species of plant life and the Bengal tiger sanctuary with other wildlife such as leopard, elephants and wild cats. You can enjoy the Indian safari here competently by riding on the elephant back and experience the atmosphere of a true jungle life. The next destination in the safari tour of India will be the Great Kanha National Park, which is a sure inclusion in every package of safari tours India. It is a documented preservation center of Royal Bengal Tigers along with other wild animals such as sloth bear, leopards, Indian Wild dog and Barasingha. It is the home place of the celebrated “Jungle book’ of Rudyard Kipling. Your tour of Indian safari remains incomplete if you do not experience the dense bamboo forest and Sal trees in the particular sanctuary. Asiatic lions are exhibits of the Gir National Park in your tour of Indian safari. The vast space, of around 1412 square kilometers, is covered with ravines and meadows for crocodiles, birds, wild animals and the legendary Asiatic lions. All the above safari are the “must-see” attractions of India! If you want to know more about the various wild life tours and the Indian Safari Travel Packages of India, then visit the link. Plan your visit to India and get a first hand experience of beauty of the cultural heritage of this country. You can get some wonderful tour advices and a wide choice of travel packages at http://www.drivenorthindia.com.